The ancient practice of bonsai lifts pruning to an art form. 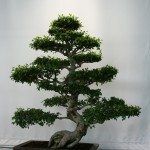 The pruning techniques for bonsai not only reduce the size of the plant but strive to mimic the natural forms of the trees that grew in the mountainous, harsh regions where bonsai originated. One of these popular forms is the cascade bonsai. Keep reading to learn about creating a cascade bonsai. Creating a cascade bonsai is intended to reflect the shape of a tree that has had a difficult time, yet perseveres. It is best to imagine a shape that was formed due to the crushing weight of heavy winter snows, land slides or mud slides. These natural catastrophes will twist the tree downward in nature and so it is with a bonsai in the cascade form. The main trunk of a bonsai in a cascade form will bend downward, past the lip of its container and past its root line. The branches on the main trunk will reach both out and up, as though it were striving for the sun. In Japanese, a cascade bonsai form is called a kengai bonsai. When creating natural looking cascading bonsais, it may help to practice these tips for shaping a cascade bonsai form. Trim away about half of the branches on the tree. Think carefully on which branches you wish to remove. It is best to remove any small or undersize branches that are growing from the trunk itself. When starting a cascade bonsai, you will need to add form wires to the plant. Wrap the 75 percent of trunk, starting at the base, in a protective covering such as raffia. Anchor a relatively thick wire near the base of the trunk and carefully wrap it up the trunk. Be careful not to wrap it too tightly as this may damage the trunk as it grows. Once the wire is around the trunk, you can wrap the wire and trunk over with raffia to help keep the wire from moving. Now we need to bend the trunk of your cascade bonsai. Think carefully on how you want your bonsai to look. 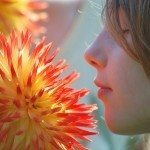 Remember, you are striving to mimic nature, not create a modern art piece. Imagine a tree heavily pushed down by snows over the edge of a cliff. The top of the tree will come down below the bottom of the tree when bent in the right shape. Once you have that shape in mind, grasp the base with one hand and bend the trunk to this shape with the other. Now you can wire the branches. Use a smaller gauge wire on the branches and, again, don’t wrap the branches too tightly. Trim away and branches that face directly the side of the container. The other branches should be bent out horizontally from the main trunk. Continue to make minor adjustments to the branches of your cascade bonsai as the branches fill out. Eventually, you will be able to remove the wires and your tree will reflect that persevering force of nature even in the face of adversity. While these are some of the more popular trees for creating a cascade bonsai, they aren’t the only ones. Any pine or juniper does well for this style of bonsai. Other trees can be used for this style as well, as long as they do not grow vigorously upwards.